When thinking about tea parties, do you find yourself overwhelmed with thoughts of the British gentry, scenes from Alice in Wonderland, Victorian decor, blue-haired ladies and pinky fingers stuck up in the air? If so, you're both right and wrong. You're right because as the tradition of "Afternoon" Tea has developed over time, it has become an elegant affair. You're wrong because "High" Tea was often enjoyed by the British working class as their evening supper, with heartier fare than the tea sandwiches and scones that are now associated with tea parties. As the custom has evolved, tea time is usually scheduled from mid to late afternoon. It's a between meal snack that is a lot more elegant than a bag of chips from the vending machine. It needn't be extremely fussy, although the meal often includes savory, bite-size sandwiches, scones or biscuits, and sweets (along with a good pot of tea, of course!) 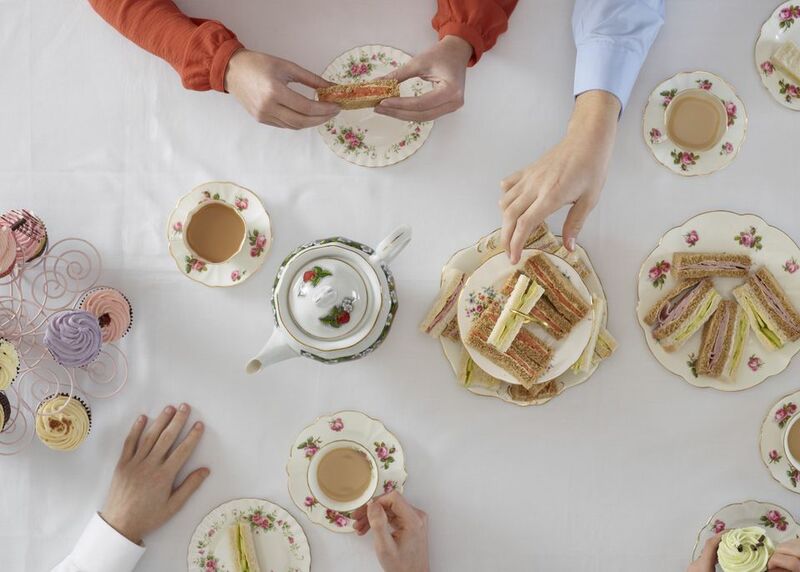 Both men and women enjoy afternoon tea in England, and it's often used as a function for entertaining business clients. An Afternoon Tea Party is suitable for many celebrations. When you'd like to host a party that isn't as involved as a dinner party, a tea party can be the answer. It's an ideal format for a bridal or baby shower, a retirement party, a birthday celebration, or time to catch up with good friends. The food is prepared before your guests arrive, and is either presented buffet style or by passing plates of goodies at the table. The only thing you need to serve is the tea itself, leaving you plenty of time to relax and enjoy your guests. Your guest list can include dozens of people or only one good friend with whom you'd like to share an intimate conversation. It can be a very formal affair as you'll find at some of the more elegant hotels, or it can be as casual as a pot of tea and some cookies. Whatever your reason for hosting your next tea party, enjoy a cup for me! In many parts of the world, tea time is an honored tradition of refinement and elegance. When you're planning a tea party—whether for a shower, graduation, birthday, or just for fun—adorn your table with your best china, silver, and linens. These add polish and grace to the occasion, and in our "paper cup" world they remind us fondly of earlier times. Select a date and send out your invitations. Depending on the reason for your party your invitation can range from a very casual invite to a formal invitation. Include a tea bag in a more casual invite for fun and to set the tone for your party. Purchase your tea and related accessories You'll want to have several teapots to brew a variety of teas for your guests. Review recipes for tea time sandwiches and treats. At most tea parties there will be a selection of both savory and sweet bites to satisfy both kinds of appetites. If your tea party is an in-between meal, you will only need a small selection of bites. If your tea party takes the place of a full meal, you'll want to offer a greater selection. Plan your menu. Include both savory and sweet food. Here is a sample Tea Time Menu. Brew and serve a proper pot of tea. Accompany the tea selections with cream, sugar and lemon slices to accommodate the varied tastes of your guests. Relax and enjoy your guests while musing on the merits of tea. Try reading the leaves for amusement. Turn to Tea Quotations and Reading the Leaves for inspiration.